The Motorola Droid Turbo joins the countless army of Android device right in the top ranks, as it packs probably the most impressive combinations of the latest silicon, a remarkably high-res display, and one of the largest batteries. Being at the very top of the Android rankings, however, exposes it to competition from all sides, including from the best selling iPhone 6. It keeps visual style much more appealing, even if that means making some other compromises. Which one would be the better choice for you? Let’s find out. The Turbo is a true ‘Droid’ soldier: powerful, with an armored, serious, almost military look. This is a style chosen on purpose, so that even the outwards masculine appearance of the device tells you it’s all about real performance power. The feeling is reinforced by the sturdy materials used to build the phone: there is a metalized glass fiber (MGF) and a nylon fiber version. The MGF sports a rubbery, utilitarian feel, while the nylon fiber has a very distinct natural fabric texture. The back of the phone is also reinforced with Kevlar fiber, and the whole phone features a nano coating so it’s water-repellent (not waterproof, though, so do not submerge it in water). The iPhone 6, on the other hand, features a much more elegant body that would appeal equally to a much wider pool of people. 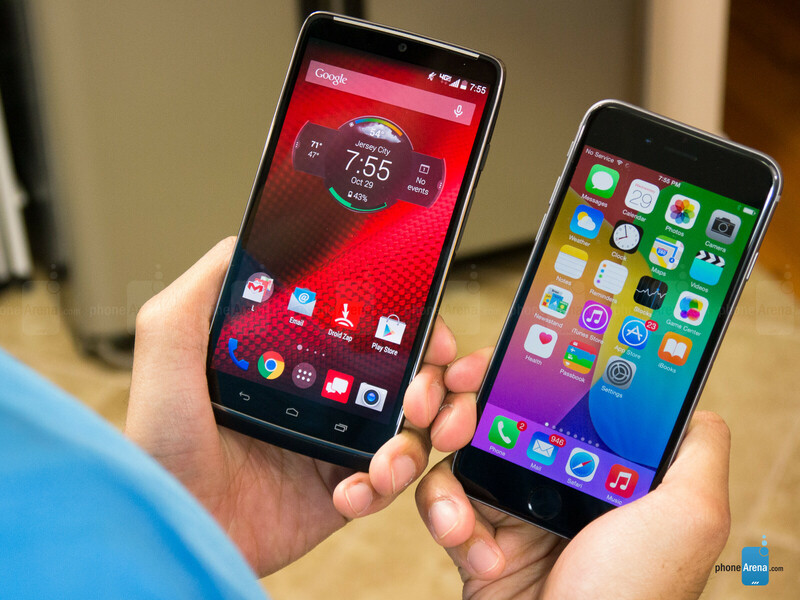 While the Droid Turbo is on the chubby side, Apple’s handset is also very slim: in fact, with the Turbo measuring 0.44” thick (at its thickest), and the iPhone 6 clocking in at 0.27”, the Droid is nearly two thirds thicker than the iPhone. The iPhone is also the smaller of the two in all aspects, but most importantly - it’s narrower, making it easier to use with a single hand. In terms of buttons, we have on-screen navigation keys on the Droid Turbo, with physical buttons of reasonable size and comfort on the right side. The iPhone 6, on the other hand, comes with high-quality, metal buttons: the lock key handy on the right, and the volume rocker on the left, and all are very clicky and easy to press. The Motorola Droid Turbo comes with a 5.2-inch AMOLED display with a resolution of the impressive 1440 x 2560-pixels (Quad HD), while the Apple iPhone 6 features a slightly smaller, 4.7-inch screen of the IPS LCD kind, but with a much lower, 750 x 1334-pixel resolution. The Droid Turbo’s screen is remarkably sharp, with a pixel density of 565ppi, one of the highest we’ve seen on a smartphone, whereas the iPhone 6 features pixel density of 326ppi, decent, but definitely not on par with the one of the Turbo. In practical terms, this is a difference that is best seen during reading, when looking at text in tiny fonts, and is not all that evident in other cases. Looking at colors, we’re not impressed with the AMOLED screen of Droid Turbo, though. It has excellent color temperature with accurate greyscale balance, but colors are way oversaturated, but inaccurate. The improper gamma also gives it an additional “contrast boost”, which is not accurate as well. The iPhone 6, on the other hand, has a slightly cold, bluish whites, but for all else it is pretty accurate. For outdoor viewing, the Droid Turbo is rather tough to read with the sun present. The iPhone 6 is much easier to use outdoors. That's mostly thanks to its excellent maximum brightness of 600 nits, while the Droid Turbo is mediocre in this aspect, peaking at just 248 nits when measured displaying all-white screen. The poor display of Droid Turbo ruins the phone for me, sadly :( Also, SD805 is one of the last SoC based on 32bit architecture. So Droidturbo is not exactly future proofing as well :/ Only Samsung was able to produce a QHD display accurately this year without it hampering on the brightness, battery or color reproduction. Oppo, LG and Motorola tried but they all failed. The Nexus 6 might have a decent display. Some people who have the device say the screen is brighter than the Nexus 5 and the Nexus 5 is quite bright. sadly its not the case , just check out PAs screen test of nexus 6 , just add the nexus 6 in the display comparison . It will be very long time before the 805 chip is out dated. 64 bit is not necessary for a vast majority of operations. The Turbo is very future proof. Just because the S805 isn't 64 bit doesn't mean it isn't capable. The Turbo display brightness rating of 248 nits is just a plain lie. Go into a VZW store and set it next to the Note 4. Very comparable. PA keeps trying to tank this great phone by falsifying its real life measurements. PS. I own the Turbo and 2nd Gen Moto X and will attest the Turbo gets much brighter. I'm surprised the battery on the iPhone 6 lasted long enough to make a comparison review. 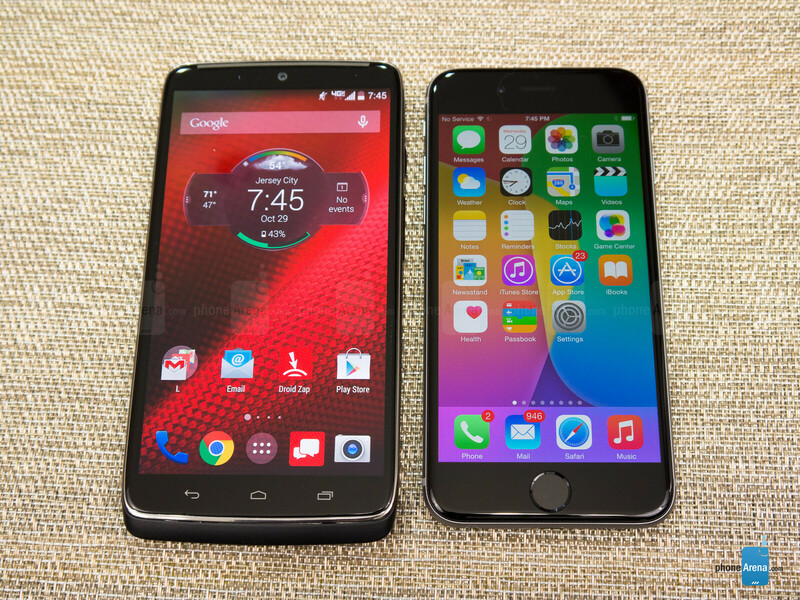 It strikes me that the iPhone 6 is half the phone the Droid Turbo is. Half the processor cores, half the clock speed, (less than) half the RAM, half the camera megapixels, half the battery, half the screen PPI, double the brightness (d'oh! ), far less than half the customization available. You android troll forget one very important thing. iPhone is 64bit phone, twice as high as this snakeskin chinese phone is. There is no futureproof with this ugly snakeskin. Next year Android moves to 64bit (finally these copycats may do it). 50x the sales though. Dis the iPhone all you wants. Men lie, women lie, numbels don't. It's the most consumers want. Sales do not decide the better phone. Dumb as ever. Year over year increases in sales, are indicative of a good product continuing to get better, thus driving greater sales. You're dumb as ever. Good products that crash, explode and bend. A phone getting better does not mean it is any good. A low end phone can keep getting better every year but is never going to be good. Again enough with sales. The iphone 6 sold well because people wanted a big screen ios phone. That does not mean the phone is necessarily good though. Are you really that stupid? You are saying it is better phone based on sales? They created big brand name with 3g and now they can just put overpriced last year specced phone in the market and every1 buys them cuz it is apple... So your argument about being a better phone is invalid. So your argument for why the iPhone is better is "Everyone else is doing it"? Didn't Apple's slogan used to be " Think different"? Guess that's changed. Wow bro, as intelligent as you are, you'd be the last person I'd expect to miss the meaning of my post. The other respondents are just simpletons. You have an opinion I respect. That was the exact same response you had the last time you responded to me. So enlighten me as to the "meaning" of your post. Just because more people want it or own it, does that make it better? I've seen you tout sales numbers a lot for your reasoning why it's better. All that means is more people like it, not that it's better or the best. All people need to worry about is what's best for them but whenever someone else says something's the best, you bring up the sales numbers. Like that should sway them. More people might like polka music, but there's no way in hell I'm gonna jump on that either. Also, I have to ask, in the past you've bragged about Apple's sales margins on the devices they sell. Why on earth would that be a bragging point? You make it seem like it's a good thing that they're making more profit per device than what other companies are. Why would you pay more for what accomplishes the same thing? Why do samsungers brag about samsungs sales? When things continue to sell better and better....just see post 25 dude. Yes it means just that, they're getting better. That doesn't mean it's the best or the ideal device for everyone. The Honda Civic and Toyota Camry are two of the highest selling cars, but there not even close to being the best. And I'm not saying the Turbo is the best, it has it's shortcomings just like the iPhone does. But other than saying that because of its sales the iPhone's the best, what else are you trying to say? Other than they sell the most? Like I said in my first post, in the beginning Apple was all about being different, but now they're all about everyone using Apple devices. Google has made their services available for Apple, why hasn't Apple done the same? If they were really about individuality like they used to be, they would make their services available regardless of the device. They are a far cry from the company I used to support. And just like the argument about Apple being a one/two model company vs Android with their plethora of devices, do you really think that the Turbo, one model on one carrier, is going to compete against the iPhone being available on every carrier? The closest thing would be the Moto X, and I'd bet that if the X would've been set up like the Turbo, it's sales numbers would be a different story. Droid Turbo 64GB $249 on contract, $649 off contract IPhone 6 64GB $299 on contract, $749 off contract 128GB $399 on contract, $849 off contract So for the same amount of storage as the Turbo, the iPhone is $50 more on contract and $100 more off contract. To double the Turbo's storage capacity, the iPhone costs $150 more on contract and $200 more off contract. That's a pretty big difference in price for what you get. 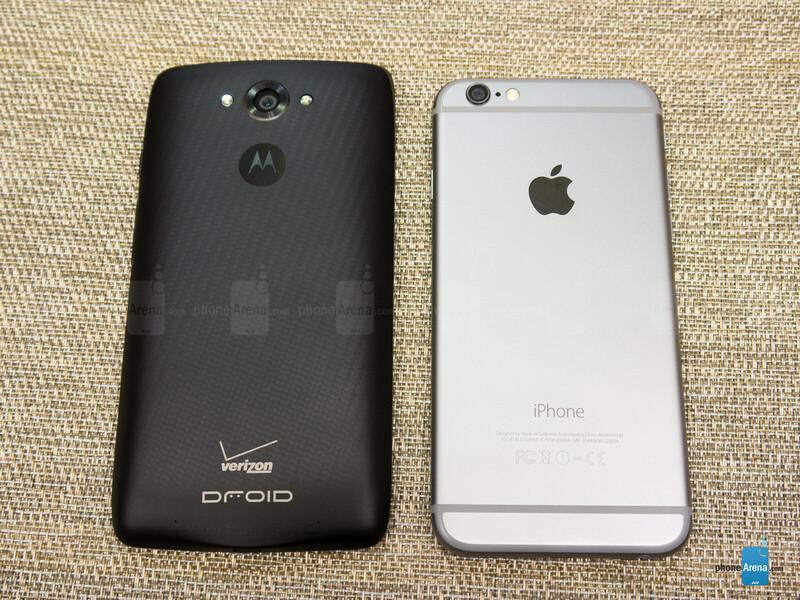 If I want a phone that sacrifices some specs for looks, I'll get a Moto X, which still comes out on top of the iPhone 6. 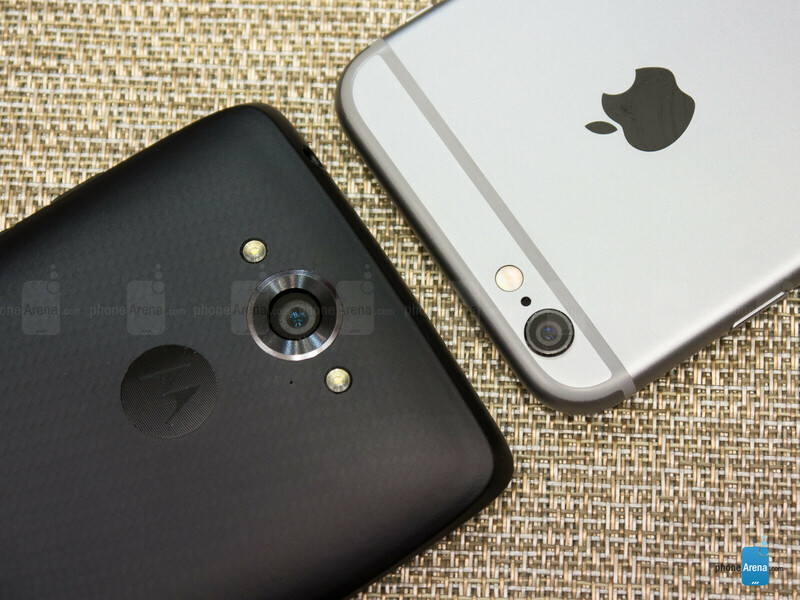 The iPhone does well against the droid turbo no doubt. It's seems only samsung does the perfect hardware when it comes to android, it's their software that people seems to hate. If the hate is just to pull samsung down because they seem to be the only real threat to apple then we live in a truly biased world. Come to think of it, when other OEMS add more to their phones it always fall short when compared to the iPhone but when samsung adds more to their phone it always outshines the less of the iPhone. The note 4s QHD screen, is not only sharp, it's got the best accurate colors, best white, blacks, less reflective and sharp screen yet draws less battery. The screen is just miles ahead of everything on the market. Their 16 mp camera though more significantly produces way sharper images than the iPhone. The images from the note is truly vibrant, detailed and beautiful. At the mall when I compared the pictures from the note 4 and iPhone 6 plus and asked my friends to choose one they all preferred the one from the note 4. Sammy seems to really be doing great stuff with hardware. I personally don't have a problem with touchwiz but I wish samsung will just address this hate issue they have with people against touchwiz so they can start getting the positive praises they deserve. The hate for their phones is getting too much and I don't even know why. The note 4 has a better display, better battery life, it's fast, has useful features, has a practical design, good camera. I just don't know why people are hating. It buffles me. A good designed iPhone against snakeskin chinese copycat? Yeah sure, there is no need to do this article at all. I think you have the completely wrong idea about Motorola's phones. Either that or you're trolling. Or both. Typical troll comment, just bashing without arguments. Snakeskin - look at this design language and backround picture. It indeed is called as snakeskin phone as are many motos. Ugly as hell. Moto phones have never looked good. This one here is a fat snakeskin. Chinese - indeed they are lenovo slaves these days. Poor moto guys, unable to make profit with these snakeskin armies, they had to sell itself first to Google. Google finded out, that snakeskins are useless. So they also wanted to get rid of moto and sell them to Chinse. Motorolla and Google says: " we dont want snakeskins anymore". Should customers want these snakeskins then?